A case study: Why aren’t bettors allowed to win? by Sportstatist • 28.08.2018 • Comments Off on A case study: Why aren’t bettors allowed to win? In addition to offering the best odds, highest limits and educating bettors, one thing that makes Pinnacle different to other bookmakers is the fact that winners are welcome. So why do other bookmakers close and restrict accounts? We asked real-life bettors to find out. Read on to learn more. Regardless of how much or how often you win, you will always be welcome to bet at Pinnacle. A unique volume-based business model and the sharpest odds in the industry means Pinnacle can give serious bettors the high limits they want and let them keep betting when they win. Very few bookmakers share the same sentiment as Pinnacle. As well as inflated margins that mean placing a bet costs more money, as soon as you start winning with the average bookmaker, they will severely limit or close your account. Three different types of bettors have shared their experience of how bookmakers stopped them from winning money. A journey that started back when online betting was only just reaching the masses, Bettor A has seen their account limited or closed by almost ten bookmakers. Primarily betting on soccer and tennis amongst other sports, none of the bookmakers would give a reason for the restrictions and account closures. While Bettor A wouldn’t reveal how he was choosing what to bet on, he says he knew the bookmakers were monitoring his betting behaviour as the odds on his selections would often move as soon as he tried to bet on them. Not only were the bookmakers refusing to let Bettor A bet how much he wanted to, they were adjusting their odds based on his behaviour. It’s fairly easy for bookmakers to identify customers who pose a potential “risk” in terms of actually making a profit. While part of the problem with Bettor A was that he was selective in what he was betting on, it was also because he was selective with when be placed a bet – targeting best market prices made it easy for bookmakers to track a positive expectation betting pattern and then limit or close his account accordingly. Was it big stakes that put bookmakers off accepting Bettor A’s bets? No, the average bet at each bookmaker before restriction or closure was no more than €50. Essentially, what Bettor A did wrong was managing to succeed in what betting is about – finding value in the market. In some cases it only took one bet to be restricted to as little as €0.50 per bet, while other bookmakers waited for a total of 33 bets before closing the account completely. The obvious lesson to learn from Bettor A’s experience is that if you want to bet when you find value, bet with Pinnacle. Not only does Pinnacle let you bet what you want with high limits, it produces educational articles that teach you things like how to calculate expected value and which staking method is the best to help you make more informed decisions. Arbitrage betting is popular amongst bettors as it guarantees risk-free profit by betting on both sides of the market. Arbitrage opportunities occur when bookmakers have a difference of opinion (which they express through odds), if they are slow to react and move the line or if they simply make a mistake (promotional offers can also lead to arbitrage opportunities). These opportunities are perfectly legitimate and you would think that if a bettor finds them, they have every right to bet on them. Unfortunately, as our next bettor found out, most bookmakers do not allow arbitrage betting. Having been a recreational bettor for a few years, Bettor B stumbled across an article on arbitrage while studying at university. Armed with some basic knowledge and €700 in savings, he invested in an arbitrage service that highlighted opportunities and begun betting with numerous bookmakers. However, within two months, Bettor B had been banned by four bookmakers and severely restricted by seven others. He had made a small profit but with limited options, Bettor B’s arbitrage betting came to an end less than 60 days after it begun. Pinnacle is happy to accept arbitrage bettors and has published several articles on the subject – ranging from a basic arbitrage betting guide to an in-depth analysis of Arbitrage vs. Value Betting. It should come as no surprise that making a consistent profit from betting is hard work. There are various approaches people take and although it is difficult to win in the long term, there is no definitive “right way” to do it. Sometimes analysing the market and using mathematical models will help you find value, sometimes you can pay for a service to show you where bookmakers don’t agree so that you can exploit it and sometimes, as Bettor C found out, you can bet on the markets that most people (including the bookmakers) don’t know much about. Not only does Pinnacle let you bet what you want with high limits, it produces educational articles that teach you things like how to calculate expected value and which staking method is the best. It’s no secret that niche markets often present more valuable betting opportunities than more popular markets and there are two main reasons for this. Firstly, there is a lack of competition in the market (fewer bettors) that means the odds won’t be as sharp. Secondly, bookmakers will pay more attention and invest more resources in the markets that offer them more profit potential (top European soccer leagues, NFL, NBA etc.). After a few years of losing money betting on Serie A, La Liga and Premier League soccer matches, Bettor C started betting on ATP and WTA tennis matches. This soon turned into ITF tennis matches and following some positive results after researching and gathering data, Bettor C specialised in women’s ITF matches. Within three months of placing his first bet on tennis, Bettor C was restricted to €1 with the bookmaker they had used for over eight years. 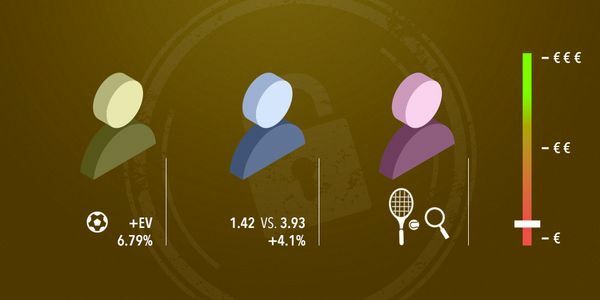 It only took nine bets with their next bookmaker of choice before being restricted and after another two months of joining different bookmakers and trying to bet on women’s ITF matches, they had exhausted all of their options (except for Pinnacle). It is also interesting to note that when asking for an explanation as to why he was limited, Bettor C was told that he could bet on other markets with no restrictions – the aforementioned high-profit potential markets were even cited as examples. How can Pinnacle afford to let people win? The reason Pinnacle can offer a unique winners welcome policy is because of its business model. A low margin model means Pinnacle relies on a higher volume of bets to make money. Instead of taking a high percentage of small amounts, Pinnacle takes a very small percentage of the high amounts its customers bet (this is also why Pinnacle offers the highest limits online). While the amount bet on each market is central to how Pinnacle operates, so too is who is placing the bets. Most bookmakers won’t accept money from bettors who know what they’re doing because it’s too much of a risk. Pinnacle, on the other hand, uses the knowledge and information provided by these kinds of customers to make more accurate probability estimations and post sharper odds. This model also shows that Pinnacle has confidence in its team of expert traders to manage the betting markets and make each side equally attractive to bettors so they can “balance the books” (take a fairly equal share of money on either side of the market to limit any potential losses). ← Who offers better value: A bookmaker or betting exchange?